Electric bicycles, or e-bikes, are a fast growing market, as many people seeking to live a greener life and replace their journey to work in a petrol or diesel powered car, with something less polluting. 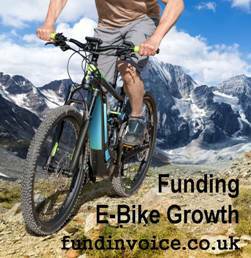 We were recently able to arrange a confidential invoice discounting facility for a UK based distributor of electric bicycles, in order to support their future growth. A confidential invoice discounting facility (also called CID for short) is a form of invoice funding that releases cash from unpaid invoices, that you have raised to your customers, on credit terms. It means that you can continue to offer your customers a credit account facility, whilst receiving most of the invoice value immediately that you raise the invoices. The discounter provides what we call a "prepayment" against your invoices. You receive the balance, less charges, once your customer pays. There are lots of different types of invoice discounting, but CID tends to be offered to more established businesses, that want to retain their credit control activity in-house. CID allows you to retain control of your credit control activity. You chase your customers for payment, so the funder is not involved with that process, as they would be if you were to use a factoring style facility. The facility is "confidential", so there are no assignment clauses on invoices, and no calls, or letters, to debtors in the name of the funder (during the normal course of business) and your customers will therefore not be aware of the involvement of the funder. An electric bicycle, or e-bike, is a motor assisted bike that reduces the need for the rider to pedal. The *growth of e-bikes in Europe has increased significantly recently, from c. 100K units pa in 2006 up to c. 1.6m units pa in 2016. With a focus on greener travel, the high growth curve trend looks set to continue. The batteries used can vary, but lithium-ion (similar to those you would use in a laptop or mobile phone) are the most popular. A typical electric bike will produce c. 350 to 500 watts of power (about the same as that needed to power a garden strimmer). "Full-power" - whereby the user provides minimal pedalling and relies heavily on on the electric function. This can lead to a more limited range of c. 10 to 20 miles. "Power-assisted" - which is similar to a hybrid car. The bike is designed such that you pedal a lot, but are powered when you need help e.g. up hills.